Local band Crenshaw Pentecostal celebrated the release of its EP during a live concert on March 27 at the GTCC Center for Creative and Performing Arts Theater in High Point. When GTCC Instructor Ron Barrans heard Crenshaw Pentecostal was going to produce its first Extended Play (EP) record, he invited the band to collaborate with GTCC on the project. 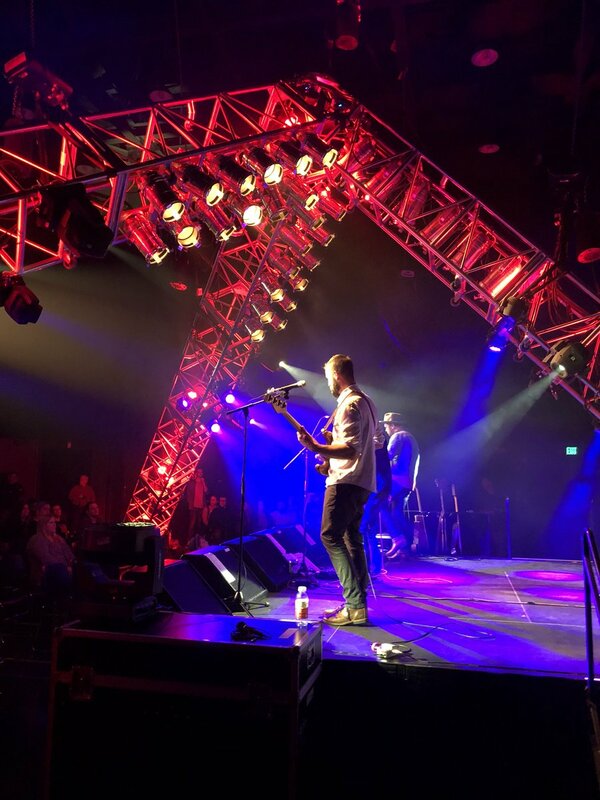 The up and coming rock ‘n roll band out of Lexington, North Carolina, is led by singer-songwriter and guitarist Zach Tilley, with Dusty Redmon on guitar, Jared Church on bass and Brian Norris on drums. Despite their extensive individual experiences in the industry prior to forming Crenshaw in 2017, Dusty says they are just a group of guys having a good time playing and writing music. Every great song needs a vessel and the students at GTCC were eager to support Crenshaw Pentecostal in making a statement with their music. GTCC students enrolled in the Entertainment Technology program are required to complete a capstone project before graduation. Capstone is the culmination of what students have learned during their two years in the program and gives them hands-on opportunities to put their knowledge into practice. Over the course of six weeks, 15 students supported Crenshaw Pentecostal with recording their EP. The collaboration provided real-world experience for the students, including Isaac Ellis who worked as a recording engineer on the project and will graduate in May. Crenshaw Pentecostal released its EP on March 27 with a live concert at GTCC’s High Point Campus. GTCC Entertainment Tech students majoring in concert sound and lighting supported the production with the stage setup, lighting and sound. “The students run the whole show and build the whole thing from scratch,” said Johnson. With the release of its EP, Crenshaw Pentecostal is now booking shows into the summer and are looking toward working on a full-length album. GTCC’s Entertainment Technology program prepares students for work in the entertainment industry. Students choose from three tracks: recording engineering, concert sound and lighting, music business and commercial music. Learn more about the two-year program here.